In the longstanding collaboration between Vitra and Antonio Citterio, Grand Relax represents the latest addition to the brand’s Home Collection. Designed with classic understated aesthetic, the reclining lounge chair offers impressive comfort thanks to the structure’s ability to adjust and accommodate small body movements. Soft cushions with feather and foam filling rest on the chair body, allowing the sitter to gently take a relaxed position as the concealed mechanism optimizes the chair’s hold to the body and its weight distribution. The mechanism’s resistance can be adjusted with a control knob, while the backrest can be fixed at any angle. The lounge chair is mounted on a four-star base of polished or powder-coated aluminum. Layering on the luxurious materials and structural dynamics of Grand Relax, a set of exceptional features were conceived for a leather upholstery. 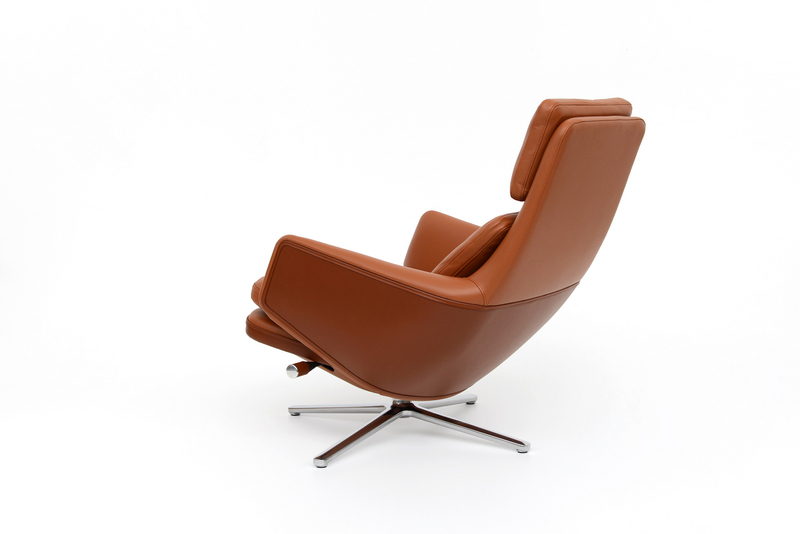 In a gesture of flexibility and firmness, high-quality leather materials envelop the user while sitting, yet they return to their original shape to honor the user’s comfort and the chair’s slender design lines. A matching ottoman can accompany Grand Relax for a complete, leisurely seating experience.